Identification: Recognizable by its unusually long legs, long antennae and yellow-brownish body. 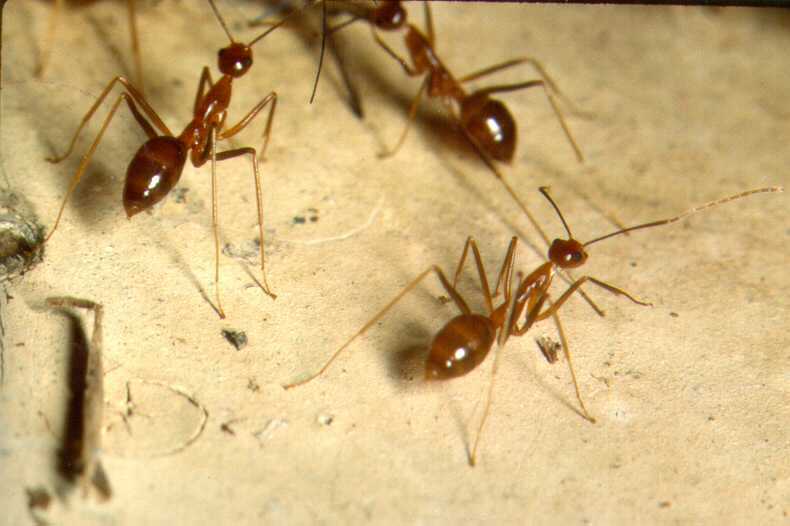 When disturbed it exhibits frenetic movements and changes in direction, hence the name crazy ant. Adults are monomorphic. Workers have long, slim bodies approx. 4-5 mm long. The gaster is usually darker than the head or thorax. Does not sting, but subdues and kills prey by squirting formic acid. NOTE: Synonym for A. gracilipes is A. longipes. Original Distribution: Not precisely known, it's native range is speculated as being West Africa. Current Distribution: Sub tropics and tropics, including East Africa, South and Southeast Asia and the Indo-Pacific Islands, including Hawaii. Particularly devastating incursions have been reported on Christmas Island. Recently reported invasions have been in tropical and sub-tropical Australia. Site and Date of Introduction: First collected on Hawaii in 1952. Has been present on Christmas Island since the 1930's. Mode(s) of Introduction: As byproduct of human commerce A. gracilipes can be translocated in soil, produce and timber. It can be hidden and transported in packing material, on boats, aircraft, machinery and road vehicles. A. gracilipes is also sometimes introduced by agriculturists as a means of biological control on coconut, coffee and cocoa plantations. Reason(s) Why it has Become Established: Highly predatory, able to forage throughout the day and night and able to do so within a wide range of temperatures. It can nest in many different locations: under leaf litter, in cracks and crevices in the soil, fallen trees, and in the case of Christmas Island it will invade the burrows made by the land crab. Worker production occurs throughout the year though it can fluctuate. Known as a "predatory scavenger" it can feed on a variety of litter and fauna, including large land crabs, birds, mammals and reptiles. Along with the ability to form supercolonies that cooperate instead of compete, this species is thus an able and successful invader. Ecological Role: In place of origin its role would of probably been as a competitor to other pests such as cockroaches, centipedes and possibly rats, probably held in check by other ant species and a predator. Benefit(s): Competitive relationship with aforementioned pests. Threat(s): As an invader the destructive potential of A. gracilipes is enormous. It can decimate endemic species including keystone species, rapidly degrade native communities and alter ecosystem processes. For example: A. gracilipes has decimated a quarter of the rainforest land crab population on Christmas Island. The crab population kept the seedling numbers in check by foraging on them. With no controls on seedlings their growth and maturation is changing the fundamental structure of the forest. In addition, A. gracilipes farms green scale insects which in high densities result in sooty mouldings that kills trees, thus thinning the forest canopy. The entire community on Christmas Island is threatened by the presence of A. gracilipes. It can also become a household and village pest; formic acid can cause skin burns and irritate the eyes of humans. Control Method: Pesticide laden bait methods have been deployed on Christmas Island. Extensive mapping of infestations is critical so that baits are ideally placed. Low levels of pesticide are used to insure that it can be dispersed in the colony among other workers and queens. This method has not managed to rid Christmas Island of the species entirely. Higher success occurred in one area of Hawaii where an infestation was identified in an isolated location and eliminated with no population comeback thus so far.